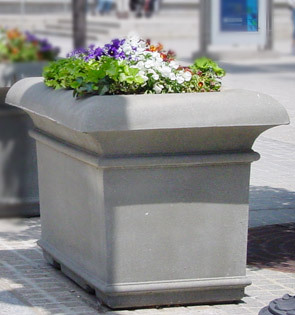 These large concrete planters are ideal for planting large shrubs or small trees, and can be effectively used as pedestrian traffic or security barriers. The heavy duty concrete construction surpasses any industry standard for strength and durability and can support more weight than resin or plastic planters. These planters allow you to line sidewalks and walkways with plants of various sizes and shapes because the reinforced concrete can contain root systems that may split less durable planters. Perfect for both indoor and outdoor environments, these square planters are available in multiple sizes. All planters come standard with drain holes for proper drainage. Available color options and finishes shown below.